SAS Data Loader for Hadoop eliminates the complexities of writing MapReduce code, with a simple, point-and-click interface that empowers business analysts to prepare, integrate and cleanse big data faster and easier than ever. In addition, data scientists and programmers can run SAS code on Hadoop in parallel for better performance and greater productivity. Download and install Cloudera QuickStart VM for CDH 5.3x. Download and install either VMware Player 6.0 or later (for Windows) or VMware Fusion for OS X 6.0 (for Mac). Download and install your 90-day free trial of SAS Data Loader for Hadoop. The Oracle Big Data Appliance is a new engineered system that includes an open source distribution of Apache™ Hadoop™, Oracle NoSQL Database, Oracle Data Integrator Application Adapter for Hadoop, Oracle Loader for Hadoop, and an open source distribution of R.
the Big Data Appliance also includes the R programming language, a popular open source statistical-analysis tool. This R engine will integrate with 11g R2, so presumably if you want to do statistical analysis on unstructured data stored in and chewed by Hadoop, you will have to move it to Oracle after the chewing has subsided. This approach to R-Hadoop integration is different from that announced last week between Revolution Analytics, the so-called Red Hat for stats that is extending and commercializing the R language and its engine, and Cloudera, which sells a commercial Hadoop setup called CDH3 and which was one of the early companies to offer support for Hadoop. Both Revolution Analytics and Cloudera now have Oracle as their competitor, which was no doubt no surprise to either. In any event, the way they do it, the R engine is put on each node in the Hadoop cluster, and those R engines just see the Hadoop data as a native format that they can do analysis on individually. As statisticians do analyses on data sets, the summary data from all the nodes in the Hadoop cluster is sent back to their R workstations; they have no idea that they are using MapReduce on unstructured data. Oracle NoSQL Database is a commercial grade, general-purpose NoSQL database using a key/value paradigm. It allows you to manage massive quantities of data, cope with changing data formats, and submit simple queries. Complex queries are supported using Hadoop or Oracle Database operating upon Oracle NoSQL Database data. Oracle NoSQL Database delivers scalable throughput with bounded latency, easy administration, and a simple programming model. It scales horizontally to hundreds of nodes with high availability and transparent load balancing. Customers might choose Oracle NoSQL Database to support Web applications, acquire sensor data, scale authentication services, or support online serves and social media. Oracle says it will integrate R with its Oracle Database. Other signs from Oracle show the deeper interest in using the statistical framework for integration with Hadoop to potentially speed statistical analysis. This has particular value with analyzing vast amounts of unstructured data, which has overwhelmed organizations, especially over the past year. Oracle R Enterprise allows analysts and statisticians to run existing R applications and use the R client directly against data stored in Oracle Database 11g—vastly increasing scalability, performance and security. The combination of Oracle Database 11g and R delivers an enterprise-ready, deeply integrated environment for advanced analytics. Users can also use analytical sandboxes, where they can analyze data and develop R scripts for deployment while results stay managed inside Oracle Database. Why open source companies dont dance? 1) Why are open source solutions considered technically better but not customer friendly. profitable startups in enterprise software. 3) How does tech journalism differ in covering open source projects in enterprise versus retail software. 4) What are the hidden rules of the game of enterprise software. 1) Open source companies often focus much more on technical community management and crowd sourcing code. Traditional software companies focus much more on managing the marketing community of customers and influencers. Accordingly the balance of power is skewed in favor of techies and R and D in open source companies, and in favor of marketing and analyst relations in traditional software companies. Traditional companies also spend much more on hiring top notch press release/public relationship agencies, while open source companies are both financially and sometimes ideologically opposed to older methods of marketing software. The reverse of this is you are much more likely to see Videos and Tutorials by an open source company than a traditional company. You can compare the websites of Cloudera, DataStax, Hadapt ,Appistry and Mapr and contrast that with Teradata or Oracle (which has a much bigger and much more different marketing strategy. Social media for marketing is also more efficiently utilized by smaller companies (open source) while bigger companies continue to pay influential analysts for expensive white papers that help present the brand. Lack of budgets is a major factor that limits access to influential marketing for open source companies particularly in enterprise software. 2 and 3) Retail software is priced at 2-100$ and sells by volume. Accordingly technology coverage of these software is based on volume. Enterprise software is much more expensively priced and has much more discreet volume or sales points. Accordingly the technology coverage of enterprise software is more discreet, in terms of a white paper coming every quarter, a webinar every month and a press release every week. Retail software is covered non stop , but these journalists typically do not charge for “briefings”. Journalists covering retail software generally earn money by ads or hosting conferences. So they have an interest in covering new stuff or interesting disruptive stuff. Journalists or analysts covering enterprise software generally earn money by white papers, webinars, attending than hosting conferences, writing books. They thus have a much stronger economic incentive to cover existing landscape and technologies than smaller startups. There is incestuous intermingling between influencers, marketers, and PR people. 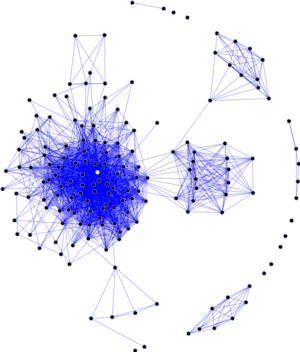 This can be proved by simple social network analysis of who talks to who and how much. A simple time series between sponsorship and analysts coverage also will prove this (I am working on quantifying this ). There are much larger switching costs to enterprise software than retail software. This leads to legacy shoddy software getting much chances than would have been allowed in an efficient marketplace. Cloud computing, and SaaS and Open source threatens to disrupt the jobs and careers of a large number of people. In the long term, they will create many more jobs, but in the short term, people used to comfortable living of enterprise software (making,selling,or writing) will actively and passively resist these changes to the paradigms in the current software status quo. Open source companies dont dance and dont play ball. They prefer to hire 4 more college grads than commission 2 more white papers. While the paradigm on how to create new software has evolved from primarily silo-driven R and D departments to a broader collaborative effort, the biggest drawback is software marketing has not evolved. 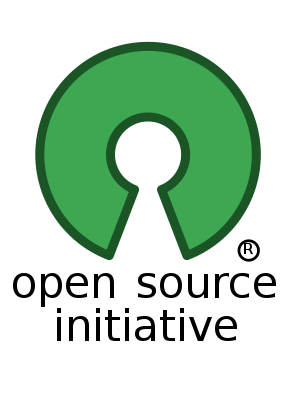 If you want your own version of the open source community editions to be more popular, some standardization is necessary for the corporate decision makers, and we need better marketing paradigms. While code creation is crowdsourced, solution implementation cannot be crowdsourced. Customers want solutions to a problem not code. Just as open source as a production and licensing paradigm threatens to disrupt enterprise software, it will lead to newer ways to marketing software given the hostility of existing status quo. Author Ajay OhriPosted on June 10, 2011 June 10, 2011 Categories Analytics, InternetTags Advocacy, Appistry, cloud computing, cloudera, Directories, enterprise software, open source, Services, Social network, White paperLeave a comment on Why open source companies dont dance? A new 5 page brochure from Revolution Analytics. Not that slick and some marketing under-kill (which frankly is a surprise)- but I guess Revolution Analytics does not have a full time graphics designer to help with it’s collateral. Take a look if you are curious how and why R is getting more and more ready for business. It remains to be seen in this announcement how much each company can leverage the partnership or whether it turns like the SAS Institute- AsterData partnership last year or whether it is just to announce connectors in their software to talk to each other. Disclaimer- AsterData was my internship sponsor during my winter training while at Univ of Tenn. The first, labeled BI Platforms, is drawn fromGartner Market Share Analysis: Business Intelligence, Analytics and Performance Management Software, Worldwide, 2009, published May 2010 , and Gartner Dataquest Market Share: Business Intelligence, Analytics and Performance Management Software, Worldwide, 2009. 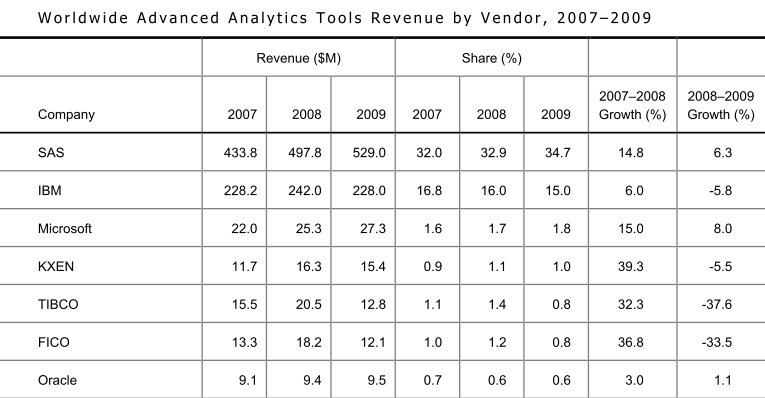 It seems that Talend’s revenue was somewhat shy of $10 million in 2008. Achieved record revenue, more then doubling from 2008. The fourth quarter of 2009 was Talend’s tenth consecutive quarter of growth. Grew customer base by 140% to over 1,000 customers, up from 420 at the end of 2008. Of these new customers, over 50% are Fortune 1000 companies. Total downloads reached seven million, with over 300,000 users of the open source products. Talend doubled its staff, increasing to 200 global employees. Continuing this trend, Talend has already hired 15 people in 2010 to support its rapid growth. Revenue run rate in the double-digit millions. 130% annual revenue growth run rate. Several hundred commercial subscribers, at an average of $25K annually per, including >100 in Europe. 9,000 paying customers of some kind. suggest it is still in early stages. 1) There is a complete lack of transparency in open source BI market shares as almost all these companies are privately held and do not disclose revenues. The degree of control by proprietary vendors on open source vendors is still not disclosed- whether they are holding a stake for strategic reasons or otherwise. 3) None of the Open Source Vendors are even close to a 1 Billion dollar revenue number. Jim Goodnight is pointing out market reality when he says he has not seen much impact (in terms of market share). As for the rest of his remarks, well he’s got a job to do as CEO and thats talk up his company and trash the competition- which he as been doing for 3 decades and unlikely to change now unless there is severe market share impact. Unless you expect him to notice companies less than 5% of his size in revenue. today announced an agreement that unites Cloudera Distribution for Hadoop (CDH) with Aster Data nCluster. The integration enables customers to leverage MPP platforms for large-scale data processing, management and analytics across structured and unstructured formats to analyze massive amounts of data for deeper business insight. Cloudera is building a massively parallel, two-way connector for high-speed movement of data between CDH and Aster Data nCluster. The connector will be supported as part of Cloudera Enterprise.